Ask a pterosaur worker from 50 years ago what pterosaurs were like when they were alive and they would have probably told you that they were ancient analogues of seabirds, flapping around over cliffs and shorelines like archaic gulls or perhaps soaring long-distance over oceans in a petrel- or albatross-like manner. This view was supported by the skewed occurrence of pterosaur fossils in sediments derived from marine environments and the anatomy of most pterosaurs known at those times: long-winged basal pterosaurs and ornithocheiroids were by far the best known pterosaurs during the mid-20th century, and seabirds are by far the best modern analogues of these forms. Beyond this, little could be definitively said of pterosaur ecology: reproduction, growth rates and feeding methods were practically unknown. Thankfully, if you asked the same question today you'd find the answer to be considerably different. While we still have many blank spaces in our knowledge of pterosaur palaeoecology, details of their life histories are slowly becoming more apparent. So, take my hand, folks, and we’ll take a whirlwind tour through the early stages of pterosaur life, their growing pains, how they stoked their metabolic engines, how they made baby pterosaurs and, finally, their individual and collective demises. What will probably be the most significant discovery of all pterosaur research in the 21st century has already occurred with the 2004 announcements of not one, nor two, but three different pterosaur eggs being found in China and Argentina. After 200 years of pterosaur workers wondering how pterosaurs reproduced these discoveries couldn’t arrive soon enough, but the fact that each egg records pterosaur embryonic development at a different stage provides some consolation for the wait. All three eggs share an extremely thin (30 μm) shell and were probably soft and leathery like the eggs of modern turtles and crocodiles. This means that pterosaurs almost certainly had to bury their eggs underground or in piles of vegetation to prevent them drying out. Furthermore, the reduced temperatures of these conditions probably extended the incubation time of pterosaur embryos to three months or so rather than the matter of weeks found in modern birds. Whether or not the parents hung around for all this time to see their flaplings hatch is a mystery, but there is evidence that pterosaur neonates wouldn’t need their parents to look them at all. One pterosaur embryo, a close-to-hatching Pterodaustro, shows fully developed limb bones that suggest it could stand, walk and possibly even fly straight out of the egg. If this is the case, pterosaurs achieved a feat unparalleled in any modern flying animals: insects, birds and bats all have to achieve adult size (or, in birds and bats, 80-90 % of the way) before their first attempts at flight. Pterosaurs, by contrast, appear to have grown up while flying, a transition that would take the some pterosaurs from yappy-little flaplings with 60 cm wingspans to sun-blocking behemoths spanning 10 m at adulthood. Neat. Fig. 1. The growth of Rhamphorhynchus muensteri. The tiny form on the left was once thought to be a distinct species from that on the right, but it’s now thought that they represent different growth stages of the same taxon. The smaller individual has a skull of 50 mm-or-so in length, while the bigger has a skull closer to 200 mm. This growth strategy may have come at a cost, however. The fibrolamellar texture of pterosaur bone suggests that they had high metabolic rates akin to those of birds and mammals and were therefore capable of rapid growth, but size distributions clusters of single pterosaur species (notably those of the Jurassic form Rhamphorhynchus) suggest their growth rate was low: Rhamphorhynchus may have taken several years to achieve its full size (Fig. 1). This is quite unlike the growth rates of the metabolically supercharged birds and mammals, so what gives? Well, both bird and mammal offspring have it pretty easy: their early days are spent sitting around, being fed and getting fat. By contrast, the precoccial existence led by young pterosaurs means that they had to find all the food necessary to stoke their fuel-hungry metabolic engines themselves, leaving little in the tank to turn into extra pterosaur mass. Hence, with so much energy spent on foraging, respiration and heat production, the growth rate of pterosaurs suffered. But, just what would baby pterosaurs, and adult pterosaurs, for that matter, be looking for to fuel that growth? Fig. 2 Nyctosaurus bobs about on the Western Interior Seaway. Pterosaur trackways indicate that they could swim, and it seems plausible that some pterosaurs would forage when alighted on the water surface like some modern seabirds. Rare pterosaur fossils preserve remains of their last meals which are, in all recorded cases to date, fish. Eudimorphodon and Rhamphorhynchus are known with digested fishy bits in association with their gut cavities, while Pteranodon and possibly Pterodactylus have fish remains preserved as peri-mortem vomited chyme deposited in their throats. Now, in almost all these cases, fish are exactly what you might expect these pterosaurs to eat and, in fact, we might expect all other rhamphorhynchines and euornithocheiroids to have similar diets. These pterosaurs are characterised by long gull- or albatross-like wings that would enable them to soar effortlessly around shorelines or seaways in search of fish and other pelagic forms, and their elongate, slender jaws are ideal for snatching fish from the water surface. Exactly how they grasped their food is controversial: frigate bird-like dip-feeding is unlikely for many pterosaurs because of their short, inflexible necks. Extreme forms of plunge diving - like that seen in a gannet, say - is also out: no pterosaurs have the streamlined skulls or robust jaw joints of deep plunge divers. One unusual pterosaur trackway shows that pterosaurs were happy punting around on the water surface (Fig. 2), so maybe they managed to procure their food by dipping their heads beneath the water surface or engaging in shallow surface-diving behaviour. Fig. 3 The filter-feeding pterodactyloid Pterodaustro. Thankfully, there is less ambiguity about the foraging methods of other water-tied pterosaurs. Ctenochasmatoidea is a group largely comprised of waders: most ctenochasmatoids have oversized, weight-distributing feet combined with long necks and jaws to search for food as they patrolled shallow water. Indeed, many pterosaur footprints appear to record such behaviour, and small, paired impressions found in association with these footprints may record pterosaur jaws contacting substrata as they fed. We can imagine that the Pterodactylus with fish vertebrae preserved in its throat may have acquired this meal in such a fashion, but another group of ctenochasmatoids, the ctenochasmatids, took a different approach to gathering food. All ctenochasmatids bear long jaws and incredible numbers of thin, needle-like teeth (Fig. 3), enabling them to procure foodstuffs by sweeping their jaws through the water like spoonbills do today or, in the case of the bizarre Pterodaustro, pumping water through sieve-like teeth to eat anything too big to filter out. Another group of pterosaurs, the dsungaripterids, also searched water bodies for food, but their robust skulls and teeth suggest they smashed shellfish and crustaceans rather than gently filtering particulate food from the water column. Fig. 4 The giant azhdarchid Quetzalcoatlus devours a helpless baby titanosaur. Some pterosaurs totally severed their trophic ties with water. 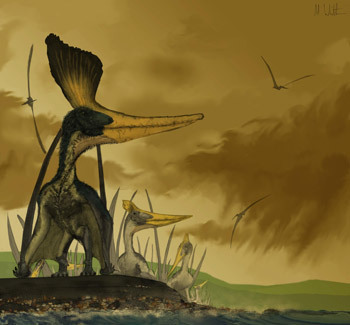 Many of these forms are found in sediments deposited in continental deposits well away from ancient shorelines, implying that we might expect these pterosaurs to dwell in open plains and forests rather than on clifftops and beaches. One such group, the anurognathids, were small but bore wide mouths and short, broad wings, all excellent adaptations for slow, manoeuvrable flight and hawking insects in midair. Istiodactylids, a group of medium-sized pterosaurs from Europe and Asia, have broad muzzles of interlocking teeth reminiscent of those seen in cookie-cutter sharks. Also armed with powerful sets of jaws, it seems likely that istiodactylids were vulture-like carcass hunters, gouging mouthfuls of dead dinosaur flesh from the huge carcasses found on Mesozoic plains. Some pterosaurs may have foraged exclusively on the ground: the toothless azhdarchoids appear well-adapted for terrestriality and may have spent much of their time wandering around in search of food. One group of azhdarchoids, the short-faced tapejarids, may have had a diet that contained bits of fruit and seeds as well as meat, but the flamboyant headgear of many of these forms would’ve limited their foraging activity to open settings. Densely wooded areas may also have been avoided for the biggest azhdarchoids, the azhdarchids, a group that includes forms that stood over 2.5 m tall at their shoulders. These leviathans appear to have wandered over Cretaceous plains in search of small animals and other bite-size consumables like oversize storks or ground hornbills. For smaller azhdarchids, like Zhejiangopterus or Bakonydraco, ‘bite-size’ may have limited their menu to smaller vertebrates, but, with jaws up to 2 m long, the quarter-ton giants Quetzalcoatlus and Hatzegopteryx may have found ‘bite size’ to include some pretty durned big animals (Fig. 4). Of course, nothing beats dining with company, and there is some evidence that pterosaurs were quite social animals. In some localities, like the Argentinean Loma del Pterodaustro and Brazilian Santana and Crato Formations, pterosaurs are the most common tetrapod fossils going, suggesting they once existed in high numbers around these sites. In fact, the Loma del Pterodaustro has so many Pterodaustro individuals that, with its filter-feeding lifestyle, it is difficult not to imagine them occurring in huge, flamingo-like flocks. Further evidence for pterosaurian gregariousness is found with the azhdarchids: many azhdarchid individuals occur in close association with three or four other members of the same species, suggesting their remains represent small groups of azhdarchids killed and preserved simultaneously. Fig. 5. Male and female morphs of Pteranodon. The male, shown here to the left, is three times the size of his female counterparts (right) and bears a far more flamboyant crest, overbite, narrower pelvis (not shown) and nastier attitude. While most details of pterosaur social life remains enigmatic, a surprising insight into the mating behaviour of pterosaurs has been revealed in recent years and provides a compelling explanation for the most elaborate feature of many pterosaur species: their headcrests. Work on pterosaurs such as Tupuxuara, Germanodactylus, Pteranodon and Nyctosaurus has revealed that headcrests sprout very late in ontogeny, implying that their utility is strictly limited to adult life. What’s more, research into the biometrics of several-hundred Pteranodon fossils shows that all known Pteranodon specimens are fully grown (or nearly so) and fall into two size classes, one sporting individuals approximately one third bigger than the other. Other than size, these groups differ in few anatomical details: the bigger Pteranodon have large headcrests and more pronounced extensions of the upper jaws over the lower, while smaller forms have comparatively broad pelvic canals. This has been taken as evidence of sexual dimorphism (Fig. 5), with the larger, fully crested and narrow-hipped forms thought to be males and the broader hipped forms being females (a broader pelvic canal facilitates easier passage of eggs, y’see). We can look further into this: strongly dimorphic forms like Pteranodon are often polygamous with males competing with each other in lek arenas for access to as many females as they can. Perhaps this competition involved contests of both visual attractiveness and physical bouts, explaining the prominent headcrests and robust jawtips of males over females. Not all pterosaurs may have been so promiscuous, however: work on Rhamphorhynchus, for instance, does not appear to be dimorphic. Unfortunately, few other pterosaurs are preserved in sufficient numbers to assess their dimorphism, but it’s clear from these two studies that sexual strategies were varied across the group. That said, there is evidence that many pterosaurs met untimely ends before getting the chance to experience mating or even maturity: having gone from birth to adulthood, it’s time to come full circle and look at pterosaur deaths. Fig. 6 A giant azhdarchid carcass attracts a crowd of velociraptorine, avian and azhdarchid scavengers. Fossil evidence for velociraptorine theropods scavenging large azhdarchids has been noted from Canada and served as the inspiration for this image. Note, however, that a solitary (and living) azhdarchid is scaring off the smaller predators. Well, this is Pterosaur.net, right? A surprising number of pterosaur fossils reveal details surrounding their deaths (Fig. 6). Pterosaur remains have been found with spinosaur and velociraptorine dinosaur teeth embedded in their bone walls, while other pterosaur remains occur as Speiballen, the regurgitated gut content of fishy or crocodilian predators. For some macabre reason, it is more tempting to imagine that these fossils record horrendous acts of predation by enormous carnivores on defenceless pterosaurs than it is to suspect scavenging (although the size disparity of one azhdarchid skeleton and its dinosaur consumer makes the latter far more likely), but no evidence exists to favour either hypothesis. Some pterosaurs have broken limbs that never quite healed and may have led to their demise while, bizarrely, a broken skull from one Brazilian pterosaur appears to record a crash-landing. Ultimately, of course, all pterosaurs met their end. Pterosaur fossils are found right up until the end of the Cretaceous, but, at this point, their record suddenly goes dry and, save for the claims of a few (perhaps slightly confused) individuals, the world has not seen a live pterosaur since. Given that pterosaurs were apparently diverse and adaptable enough to exist for 160 million years prior to their disappearance, it’s not unreasonable to ask why they should vanish so absolutely at the end of the Mesozoic. Unfortunately, the answer to this is murky at best, though there are some trends in the Upper Cretaceous pterosaur record that provide some clues. Most pterosaurs of this time are of medium or large size, for instance, and most are azhdarchids. This suggests that pterosaurs were being forced into specialist roles, an action suggested by some to be accredited to those feisty young upstarts, the birds. Birds may have competed with pterosaurs for ecological space replaced the smaller, generalist pterosaurs seen at other stages of their evolutionary history. However, neither the Upper Cretaceous bird or pterosaur fossil record is superb, so evaluating the accuracy of this claim is difficult. Whatever the reason, without small, adaptable and rapidly reproducing generalists to pull them through the environmental stresses that mark the end of the Mesozoic, pterosaurs were reliant on the their slow breeding and environmentally sensitive giants to continue their lineage. However, such animals are the first to die out following rapid environmental change, and the last pterosaurs struggled to adapt to the changing world of the late Meszoic.